Going to work, a casual party, brunch or just a walk in the park and want to dress cute? My idea is.. Midi skirts! Midi skirts are defined as the skirt part of a dress, ending at the middle of the calf: midi. Of course wearing a dress is very nice too and perhaps even easier but styling the midi skirts is more fun, right? Together with the wonderful spring, flowers and cherry blossoms blooming and nice weather (not in Denmark), another wonderful thing that is ahead us are weddings. 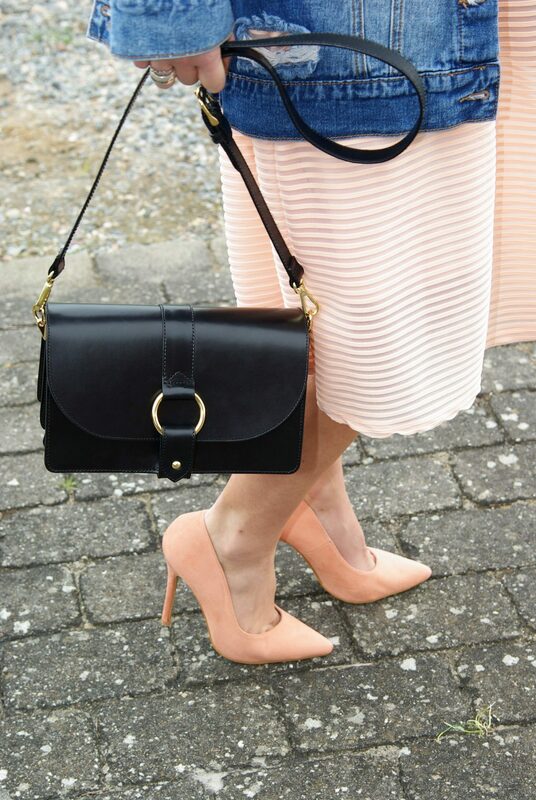 As a guest at a wedding, I would pair a midi skirt with an additional and very important item: a really nice clutch. I got my eyes on this one here because I just love that color for this season. It’s simple, easy to carry around, has 3 compartments and it’s a Kate Spade, what’s not to love about that? Regarding my outfit, I took these pictures in front of a the Hempel glass museum, a very beautiful area. I hadn’t planned to wear the jeans jacket, but it was just too cold to say for more than a few minutes without. In the end I think it turned out great after all, right? They fit good together. The black bag I just got, was very much to your likings from what I could see on Instagram, and I thought I would add it to the outfit. It’s classic vintage premium leather, designed in Paris and you can find it here, they also have it in a pinkish version here. I actually really liked the pink version more, but I went for black because it’s the kind of color I can wear with almost everything, but I am saving up to buy the pink one also. Since we were talking about midi skirts, I made a little (big) selection of my favourites that I would like to have for this Spring. I may have gone a little overboard with the list but it was just hard to stop. I can’t afford to buy them all unfortunately, but I can pick one of them, which one should it be? Don’t forget to stay updated with the new post on BlogLovin and follow me on Instagram, Facebook, Pinterest and Twiter.